Former Israeli ambassador says Israel killed most of those behind 1990s terror attacks on Argentine Jewish buildings. Israel has killed most of those behind the deadly attacks on its embassy and a Jewish charities building in Argentina in the 1990s, a former Israeli envoy said Thursday, AFP reported. Itzhak Aviran, who was Israel's ambassador to Argentina from 1993 to 2000, thus broke away from the ambiguity policy Israel usually practices. 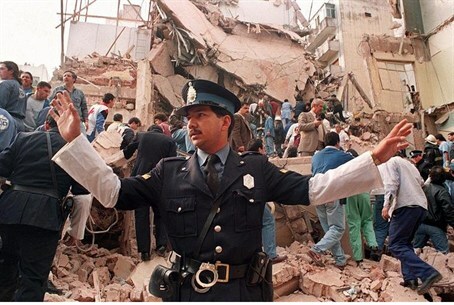 The July 1994 bombing of the Argentine Jewish Charities Federation (AMIA) building in Buenos Aires killed 85 people. Hundreds were hurt in a bombing Argentina says was masterminded by Iran. Tehran's clerical regime has denied the charges. Two years earlier, in March 1992, a car bombing in front of the Israeli embassy in the capital killed 29 and wounded 200 others. "The large majority of those responsible are no longer of this world, and we did it ourselves," Aviran was quoted by AFP as having told the Buenos Aires-based AJN Jewish news agency. Two decades after the blasts, those who instigated them have not been brought to justice. Neither Carlos Menem, who was Argentina's president from 1989 to 1999, nor his successor Fernando de la Rua and those who followed "did anything to get to the bottom of this tragedy," Aviran told the Argentine news agency. "We still need an answer (from the Argentine government) on what happened," he added. "We know who the perpetrators of the embassy bombing were and they did it a second time." Argentine courts have charged eight Iranians over the AMIA bombing and authorities are demanding their extradition. They include former defense minister Ahmad Vahidi and ex-president Akbar Hashemi Rafsanjani. Argentine authorities also suspect Iran of being behind the 1992 bombing. Last year, Iran and Argentina reached an agreement about creating an independent “truth commission” to investigate the AMIA bombing. Iran has confirmed that it would cooperate with the probe, but has declared in the past that no Iranians facing international arrest warrants over the bombing would be questioned by Argentine judges. The Argentine opposition and representatives of the country's 300,000-strong Jewish community strenuously opposed the agreement.